The game we've all dreamed of, Snack World, has a date for release, sadly that date is only in Japan. Next year the game comes out on mobile devices in April and on the 3DS in July. Nothing for the U.S.A, eh? Level-5 is sure waiting to release a game we've been holding our breath's for. It's not because of the cartoonish Dragon Quest style world of dungeons & convenience stores, though we really like it. 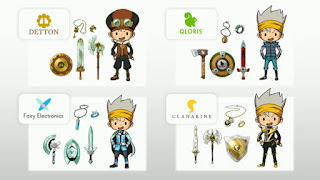 It's because of the real world items, little swords, shield and wands, perfect for keychains that'll have chips in them that you can touch to your 3DS and mobile device that unlocks the weapons or items in game. The items are so realistic that they made mock commercials as though they were real products from different companies. Check them out below. Are real questions remain as to when Level-5 will get this game to the U.S.A. and if we don't have a new 3DS by the time it comes out.